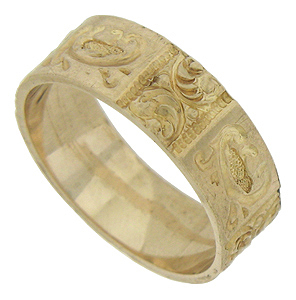 Vignettes of deeply engraved organic figures encircle the face of this handsome antique wedding band. 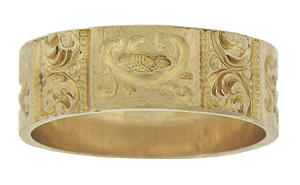 Fashioned of 10K rose gold, the Victorian wedding ring measures 4.78 mm in width. Circa: 1880. Size 2. We cannot re-size.